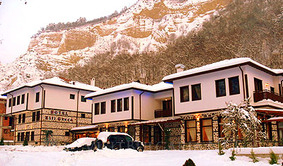 Location: Spa Hotel Elli Greco is situated in Melnik town in Bulgaria. The hotel is situated just 20 kilometres from Promachonas Grecce and just 18 km of town Sadanski. Accommodation: Spa Hotel Elli Greco offers 31 double rooms and 13 apartments. All rooms are equipped with air-conditioning, individual bathroom, satellite TV. You can choose between view towards the Melnik River, or the XIII-XIV century Despot Slav's stronghold.